I finally took some pictures of my bedroom to share. It's not perfect, but a vast improvement to the ugly beige box that it was before. I'm still not quite happy with the area around my dresser (too much black over there) - but I've found I'm never really completely satisfied with a room. It drives Zach a little bit crazy to say the least. Speaking of Zach, there he is, refusing to get out of my before picture. 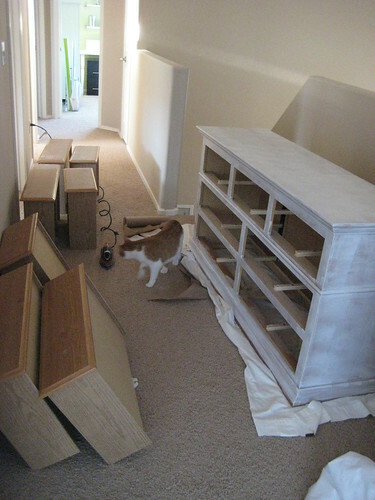 The biggest project in this room was painting my laminate dresser. I used this tutorial. Paint color - Valspar "Rising Tide"
Love it! The room turned out so good, and I love the dresser! 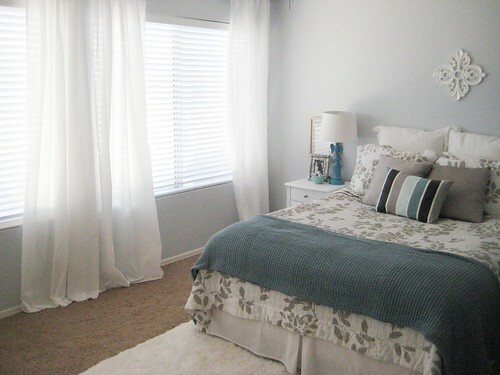 The white curtains give the room a very airy feel. I feel like I need close up shots of the nightstand set up and the dresser hardware, eh? LOVES IT. It looks so soothing. Good job on your color choices. I love that blue paint. Very soothing and peaceful. Looks fantastic! 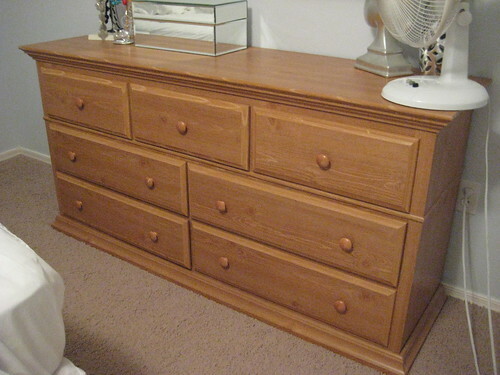 I actually thought the dresser handles were new! The room looks great. We just redid our master and I love that white iron thing hanging behind your bed. Where is that from? what color paint is on your dresser? I love that gray! I love it! It looks great! If you think it's too much black by your dresser.. what about painting the frames white? Love it! Where did u find the fan on your dresser?? Fantastic job! It looks really lovely! 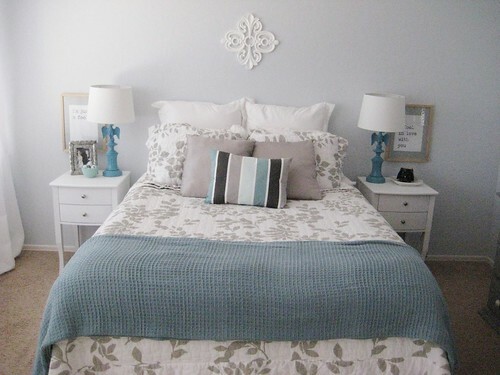 I love the touches of blue and the picture arrangement above the dresser. Looks fab! Your room's total makeover is just breathtaking! I have to commend you for the awesome choice of paint color. The wall paint complements well with the dresser. I have been helping my friend, Anne, with her bedroom and personal bathroom renovation. We're almost done with the bathroom. The tile (Sarasota) pieces are gorgeous. Yesterday, we went back to our nearby carpet and tile stores (Tampa), she picked a fantastic nylon carpet for the room. We can't wait to see her new room. Thanks! 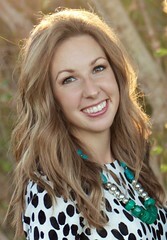 Erica, for sharing the photos of your inspiring room transformation! The tutorial for the dresser says its not a valid page anymore. Any other suggestions on how to do the dresser? I love the bedding! what brand is it? 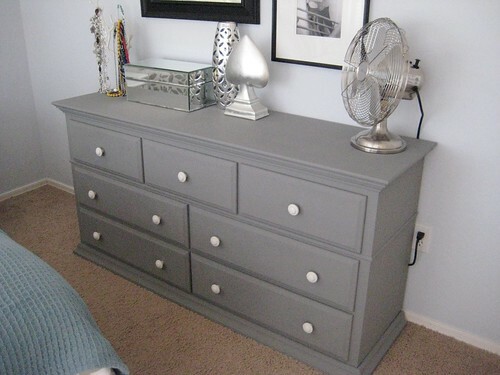 Love the gray dresser! What color did you use? ?